Tracy and Peter Nielsen at the Santa Rosa warehouse where their wine is processed, fermented, aged and bottled. Whenever I visit wineries, I'm reminded of what hard work winemaking is. It sounds so fun and glamorous, but it's farming and that's a very tough business to be in. Many new winemakers give up another career — and a steady paycheck — to pursue a passion of making quality wine. Tracy and Peter Nielsen of Sonoma's La Pitchoune winery are two of these (some may say crazy) people! They had dreamed of starting a winery for years before their first vintage in 2012 and they're now making mouth-watering, food-friendly wines, mostly Sonoma Coast Pinot Noirs and Chardonnays. Last November I met Tracy at the production facility in Santa Rosa where the wines are made and stored. It was just a few weeks after the devastating wildfires had ripped through Northern California. "Standing amongst rows of wine-filled barrels, Tracy begins telling me about the day she returned to the wine production warehouse. 'I wasn’t expecting to get so emotional and I just needed a minute to compose myself,' she says. 'We live twenty minutes west of here and this is as west as the fire went. If it had gone any further, this building would be gone.'" (Excerpt from my article on Grape Collective. Read the full article here). Tracy and Peter also produce a small amount of white wine, a Chenin Blanc, made from grapes grown on an island in the Sacramento River Delta. Tracy will be at Grape Collective, 2669 Broadway this Saturday, June 16th, from 6 - 7 PM (tasting goes from 5:30 - 8 pm). 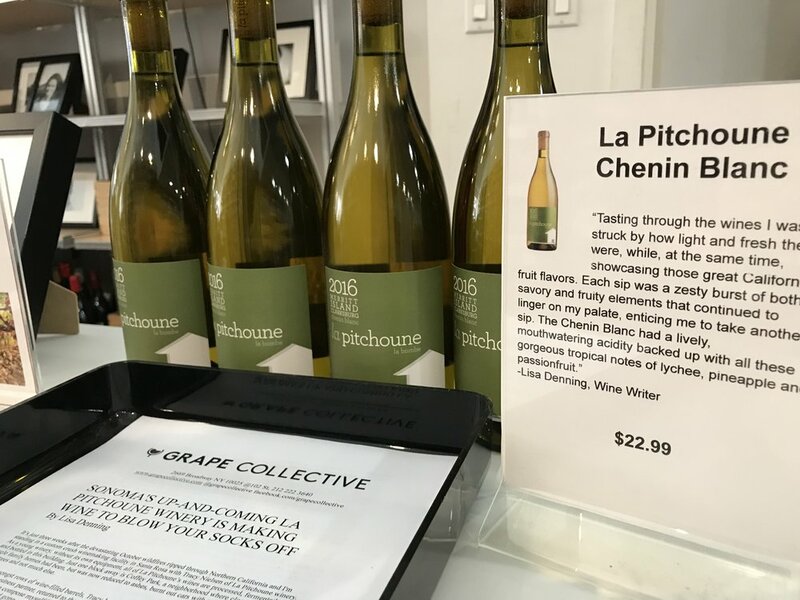 Kick off your night with a free tasting of La Pitchoune's delicious Chenin Blanc while supporting passionate young winemakers.